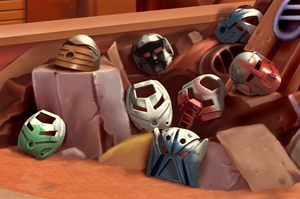 Kanohi Masks are objects from the LEGO BIONICLE storyline, and the most common of the franchise's "collectibles". Many major characters wear these masks, specifically Toa, Turaga, and Matoran. Kanohi Masks are some of the most well-known items in the BIONICLE universe, being worn by several prominent races and beings including the Matoran (the world's largest race), the Toa (destined heroes), the Turaga (Matoran elders), the Makuta (prominent guardians, now corrupt), and Artakha and Karzahni (famous figures of legend). Very rarely are Kanohi seen removed from these and other Kanohi-wearing beings, because if the masks are taken off for an extended period of time, the wearer begins to weaken; and Matoran will eventually shut down until a Kanohi is placed on their face. Kanohi Masks are connected to their wearers, so much so that when the wearer is physically changed, often the mask changes along with them. For example, if a Matoran gains power and becomes a Toa, then their mask will change from its powerless form into a fully functional Great Mask. Likewise, Toa becoming Turaga will have their masks depowered into Noble Masks. This connection is so strong that for a short time after a wearer's death, an imprint of their spirit lingers in their mask; if enough life energy is infused in this imprint then the wearer can be resurrected from death. There are several ways to create Kanohi Masks, but the only one known is to melt down Kanoka disks and fuse them together. Regular Kanohi (often referred to as Matoran masks) have no special powers, but keep their wearer alive and healthy. They are the most common masks, created using Kanoka disks with a power level of 6 or less. Noble Masks have weak special powers that require some mental focus to activate. They are created using disks with a power level of 7. Great Masks are stronger than Noble Masks, but require more willpower to use. Their powers are accessible only by Toa or other mentally potent beings. They are created using disks with a power level of 8. Legendary Masks let the wearer control one of the fundamental laws of existence, and if not used properly, the effects could be devastating. Toa and other beings with strong willpower can access these powers, but it is a constant struggle to keep the powers under control. There are only five known masks of this type: The Vahi Mask of Time, the Avhokii Mask of Light, the Kraahkan Mask of Shadows, the Ignika Mask of Life, and the Mask of Creation. Some of the Toa Hagah's masks are carved not to match their power but to honour past heroes. The Toa Nuva have masks that adapt their shape to local terrain. The Makuta can shapeshift, and this ability extends to their masks. The mask's level has a bearing on its colour. Masks are usually silver-gray, and when worn they take on the colour of the wearer (though for a short time when the Toa Nuva lost their elemental powers, their masks began to slowly fade back to silver-gray). Sometimes a mask is metallic-coloured, which indicates either a special mask (such as the Vahi and Avohkii) or a special wearer (like the Toa Hagah); metallic masks are generally not any more powerful than plain-coloured versions. In addition, mechanical enhancements can be built into masks of any level. One fairly common enhancement is a telescoping eyepiece that allows the wearer to see over long distances; this seems to be a standard addition to Great Akaku masks, and possibly Great Matatu masks as well (though as there are only two known Great Matatu wearers - Toa Nuju and Kazi - it's hard to say whether all such masks have eyepieces). The Toa Mahri's masks have also been altered to allow underwater breathing, and Toa Kopaka's Akaku Nuva has adapted to include a laser targeting system instead of the telescoping eye piece. Different powers are contained by different masks. Here is a list of the known Kanohi, along with their Matoran name and their power. Great Masks are the most commonly-seen Kanohi; worn by Toa and other mentally powerful beings. By being dipped in energized protodermis, they can be upgraded into Kanohi Nuva, whose enhanced powers can be shared with others but can only be used by Toa Nuva (see under "Variations", below). Legendary Masks contain fundamental forces of the universe. Any being wishing to use these powers must struggle to keep them from running wild, and if a mask is damaged its power will leak out uncontrollably. For more information, see "Kanohi Histories" below. Ignika Mask of Life Can evolve existing life and give life to inanimate objects; and is said to have the power to take life away as well. However, it cannot restore life to the dead (unless the death was extremely recent) because it cannot recall a spirit that has passed on. Requires the user to sacrifice themselves to release its power (as Matoro did when he healed Mata Nui). Vahi Mask of Time Allows the user to speed up or slow down time around a target. It is not capable of reversing time or time travel. Golden Kanohi: When each Toa Mata completed their quest to find a set of six Great Kanohi hidden on Mata Nui, they each received a Golden Kanohi. The Golden Kanohi were in the shape of their original masks, but had the powers of all six. However, other Toa (like Lhikan and Iruini) have worn golden-coloured Kanohi that have displayed no additional powers. Silver Kanohi: Silver versions of Toa Mata masks were made available in Kanohi Mask packs (see under "Collectibility", below). Although not officially part of storyline, these silver masks are unofficially considered to have three powers each: the Hau-, Kakama-, and Pakari-shaped masks have the powers of Shielding, Speed, and Strength; while the Akaku-, Kaukau-, and Miru-shaped masks have the powers of X-Ray Vision, Water Breathing, and Levitation. Therefore, they are probably best considered to be different forms of the Aki and Rua Kaita Masks. Though again, other Toa (like Norik and the new Toa Ignika) have worn silver-coloured Kanohi with no additional powers. Copper Masks of Victory: Copper-coloured masks are awarded to Matoran for winning in sports. They are normally not worn, but instead kept as trophies. Copper masks are usually seen in the shape of a Noble Huna, but there are also Noble Komau. Infected Kanohi: When a Kraata touches a Kanohi, it becomes infected and takes on a pitted, rusted appearance. If worn, the wearer will be under the control of Makuta until the Kanohi is removed. Kanohi Nuva: When immersed in energized protodermis, Great Kanohi can transform into Kanohi Nuva masks with even greater power, duration and extent. Kanohi Nuva can only be used by the Toa Nuva, but their powers can also be shared with others nearby. Six of the 36 Kanohi Nuva known to exist were transformed from the Golden Kanohi when the Toa Mata became Toa Nuva; and the remaining ones were made by the crafters of Artakha. Artakha has since made adaptive armor for the Toa Nuva that changes its shape depending on the immediate terrain; and adaptive Nuva Masks are included in this. Their powers are the same, but at least Kopaka's has changed mechanical enhancements. When the Toa Metru were mutated into the Toa Hordika, their Kanohi fused to their bodies and essentially became their faces. In this state, the Toa could not use their mask powers (though Nuju was seen using his mechanical eyepiece in Web of Shadows). Due to the strange cause of the Toa Inika's transformation, their masks were organic and alive. The masks could move and tended to recoil when touched by anyone other than their owners; they could also activate their own powers when they sensed their owners wanted to use them. The Avohkii Mask of Light was forged by the residents of Artakha. The mask was intended to be an insurance against darkness should the Brotherhood of Makuta ever rebel. Being creatures of shadow, with the fear that the Avohkii could be used against them, the Brotherhood stole it from Artakha and hid it away in one of their fortresses. Some time later, the Brotherhood's bodyguards, the Toa Hagah, discovered how corrupt the Brotherhood had become and rebelled against them. They were caught and mutated into creatures called "Rahaga", but not before they recovered the Avohkii from the Brotherhood's stronghold. One of the mask's guards swore revenge on the Rahaga and joined the Dark Hunters in his quest to reclaim the mask; he was given the codename "Seeker". When the Rahaga came to Metru Nui some time later, they hid the Avohkii somewhere in the city. After the Brotherhood's Visorak armies invaded the city, the Rahaga instructed the Toa Hordika to recover the six Makoki stones (also in the city) so they could unlock the mask's hiding place and claim it before the Visorak do. The Toa did so, though in the process, Toa Onewa hit the mask with his Rhotuka spinner and encased it in stone in order to protect it. The Toa brought the Mask of Light with them when they relocated to the island of Mata Nui and became Turaga; Vakama fashioned the stone covering into a totem and hid it in a lava cave, where it remained for a thousand years. Eventually, a Matoran named Takua, who had a tendency to go off exploring, entered the cave and found the totem; when he dropped the totem into the lava, it melted away and revealed the Avohkii inside. Turaga Nokama was then able to read an inscription on the inside of the mask, which said it belonged to a Toa of Light that must be found. Takua and his friend Jaller set out to find this Toa of Light, evading the Rahkshi that were sent out to claim the mask. During a final confrontation between the Rahkshi and the Toa Nuva at the Kini-Nui Temple, Jaller jumped in the way of a fatal blow meant for Takua. Jaller's sacrifice led Takua to accept his destiny; he put the Avohkii on his face and became Takanuva, the Toa of Light that he had been searching for. The Avohkii also had the ability to transform its destined wearer from a Matoran into a Toa, much like a Toa Stone does. It also seemed to impart knowledge to Takanuva, giving him the know-how to build an Ussanui vehicle. Fans often refer to the Mask of Light with the abbreviated term "MoL". The Ignika Mask of Life was created by the Great Beings to restore the Great Spirit Mata Nui's life energies if needed. With Mata Nui near death after Makuta's attack, it has become the center of several battles between the Toa who wish to save him and groups who want its power for their own gain. The Toa Mahri eventually succeeded in rescuing Mata Nui, but soon the mask will follow their example and take the form of a Toa itself. Also the mask of life was made to keep the universe in order. If there was a famine, if the citizens took to war, if all hope was lost, the Ignika would drain the life from every being in the universe, so that it would all be over. Turning from gold (when Mata Nui was perfectly fine), to silver (dying), yellow (death is imminent), to at the end, black. The possibility of a Mask of Time being made was known far before it was ever forged. 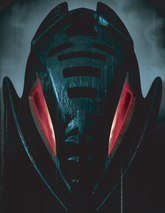 The Brotherhood of Makuta created the Voporak mutant capable of detecting the Vahi's power in preparation for when such a mask would be made; Voporak was then given to the Dark Hunters so that he would not be idle in the meantime. Just prior to the Great Cataclysm, Makuta (unknown to the matoran,possesing turaga Dume) asked Metru Nui's best maskmaker Vakama to try and forge a Vahi, but this request was forgotten when Vakama became a Toa Metru. Vakama would later remember "Dume's" request during the Great Cataclysm. By that time, the Toa Metru had collected six powerful Great Kanoka Disks, and he was able to combine them and forge them into a Vahi. He tried to use the mask against Makuta, but his inability to fully control its powers proved little help. In the end, the Vahi fell into the sea. After rescuing the Matoran from the Visorak, Vakama later found the Vahi broken, leaking tons of energy. He was able to repair the damage, only to have it taken by Voporak. He then got caught up between Makuta and the Dark Hunter's leader, the Shadowed One, both of whom wanted the Mask of Time themselves. Vakama was able to get away with the mask when the two began to fight amongst themselves, and when Makuta chased him down he threatened to destroy the mask which would destroy all of reality rather than give it up. Makuta reluctantly gave in to the demands Vakama made, and made himself content with knowing where the Vahi was as he knew Vakama would make good on his threat if he tried to take it again. A thousand years later, Vakama gave the Vahi to Toa Tahu, who attempted to use the mask against the Bohrok-Kal. Again, it proved little help, but it did give the Toa Nuva enough time to come up with another strategy. Voporak and the Dark Hunter codenamed "Ancient" are currently hunting the Vahi down again after Voporak detected this use. Tahu has since returned the Vahi to Vakama. The Vahi was originally golden in colour, but later turned orange due to seawater exposure. Extreme care needs to be taken with the Vahi, as even slight damage would cause its power to leak out and cause temporal anomalies in its immediate area. If it were to be destroyed, the entire timestream could collapse. As the first of BIONICLE's collectible items and some of the franchise's most recognizable icons, there are several Kanohi masks available. Toa Mata: red Great Hau, blue Great Kaukau, green Great Miru, brown Great Kakama, black Great Pakari, and white Great Akaku. Turaga: orange Noble Huna, light blue Noble Rau, lime green Noble Mahiki, tan Noble Komau, dark gray Noble Ruru, and light gray Noble Matatu. Toa Nuva: red Hau Nuva, blue Kaukau Nuva, green Miru Nuva, brown Kakama Nuva, black Pakari Nuva, and white Akaku Nuva. The Kanohi Mask Pack (Summer 2001) had the masks of the six Toa Mata in all six Toa colours and those of the six Turaga in all six Turaga colours. The Krana Pack (Winter 2002) had the six Toa Mata masks in both gold and silver colours. The Kanohi Nuva & Krana Pack (Summer 2002) had Kanohi Nuva in all six Toa colours. The Krana-Kal Pack (Winter 2003) included silver-gray "protodermic" Kanohi Nuva. Altogether, there are 48 Great Kanohi, 36 Noble Kanohi, and 42 Kanohi Nuva. The Great and Noble Kanohi also came in various alternate colours, in both Matoran and Rahi sets as well as some misprinted colours, but these colours are not listed. Solid 14-carat gold Hau Masks were awarded to winners of BIONICLE related competitions. Only 30 exist and each is worth around $800. Chrome silver-coloured Hau (labeled "Kanohi Rua") were part of 2001's "Power Pack". Copper-coloured Huna and Komau were distributed at LEGOLAND Billund and LEGOLAND Windsor in 2001. Fluorescent green Miru were distributed at LEGOLAND California and LEGOLAND Windsor in 2001. Orange Vahi Masks of Time were distributed in early 2002 through ACD Distribution. Copper Hunas and possibly Copper Komaus were distributed at Blockbusters in 2002-2003. Red-and-green "Poisoned" Hau Nuva Masks were distributed at LEGO Brand stores in late 2003 to promote the Mask of Light movie (where Tahu Nuva becomes poisoned). Gold-coloured Vahi were included with late releases of Vahki sets in Target stores; a tie-in with the Legends of Metru Nui movie. Although not promotional, the Noble-shaped masks of the six 2004 Matoran sets are notable for having silver-coloured streaks on their upper halves. 2003: Takanuva sets included two Great Avohkii masks, one gold-coloured and the other sparkly clear; and Makuta sets included a black Great Kraakhan mask, and two silver Great Avohkii used for Matukas hands. The Takutanuva combination set (composed of Takanuva and Makuta sets) also included a "Movie Edition Kraahkan", shaped slightly differently to better match Makuta's face as seen in the Mask of Light movie. 2004: Each Toa Metru set came with the appropriate mask: red Great Huna, blue Great Rau, green Great Mahiki, brown Great Komau, black Great Ruru, and white Great Matatu. Turaga Dume and Nivawk sets included a red-and-black Noble Kiril; and Toa Lhikan and Kikanalo sets included a new version of the Great Hau, coloured gold. The "Ultimate Dume" combination set (composed of Turaga Dume & Nivawk, Nidhiki, and Krekka sets) came with an altered version of the Kraahkan mask, designed to specifically fit the combiner model and not compatible with other mask-wearing sets. 2005: Toa Iruini sets included a gold-coloured Great Kualsi (its companion set, Toa Norik, included a silver-coloured Noble Kiril). 2006: Each Toa Inika set came with the appropriate mask: red Great Calix, blue Great Elda, green Great Suletu, metallic gray Great Sanok, black Great Kadin, and white Great Iden; these masks are only compatible with Toa Inika sets. Axonn sets included a silver-coloured Great Rode; Brutaka sets included a gold-coloured Great Olmak; and in Vezon and Fenrakk sets, the back side of Vezon's light gray "face" piece is an Ignika Mask of Life that can be worn by other sets. 2007: Each Toa Mahri set comes with the appropriate mask: red-and-orange Great Arthron, blue Great Faxon, green Great Zatth, black-and-yellow Great Garai, silver Great Volitak, and silver Great Tryna; the Garai is not compatible with any mask-wearing set prior to 2004 due to the fact that it attaches to the set's forehead instead of its "mouth". The "face" pieces of Hydraxon and Maxilos sets can also be worn by mask-wearing sets. ↑ Accounts of its location differ: a series of online animations portrayed the Mask of Light as hidden in the Great Temple, while the BIONICLE Encyclopedia says the mask was in the Archives. This page was last edited on 3 July 2016, at 11:57.